Nutty, buttery, and so much fun! These funfetti cookie balls are such a delicious way to enjoy the holiday season. Perfect with a cup of hot cocoa! This is a sponsored post, written by me, and created in partnership with Diamond of California. All opinions expressed herein are straight from my heart. It’s a brand new week! Are you ready for it? Did you get lots of rest and good food over the holiday? I know I did. I’m raring to go today. It’s time for holiday baking! 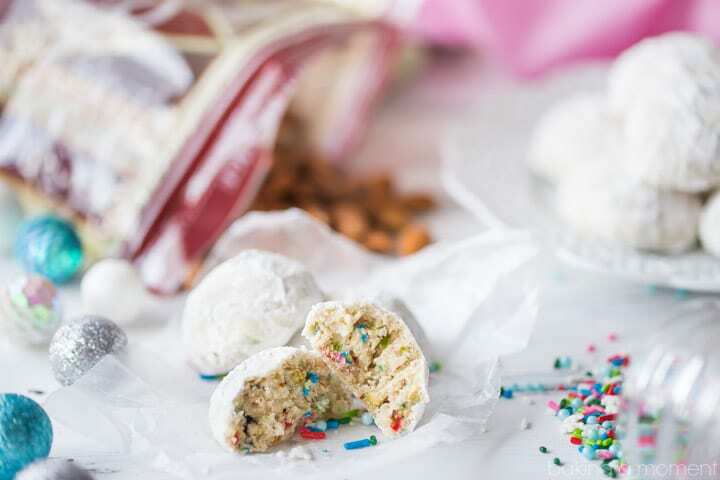 I just can’t wait to dive in, and I think these funfetti cookie balls are the perfect way to kick off the season. The basic snowball cookie is simple perfection. Buttery, slightly sweet, and full of rich, crunchy nuts. I’ve used a combination of macadamias, pistachios, and almonds for this recipe, but you can use any nut that you like. I think the almonds are particularly well-suited, and they really allow the sweet vanilla funfetti flavor to really shine. When it comes to nuts, Diamond really has your back, especially around the holiday season. They’ve been around for more than 100 years, and there’s no better time than the holidays to connect Diamond’s rich heritage to your own family traditions. With Diamond, you have your choice of walnuts, pecans, almonds, and beyond. Always fresh, always high quality, always a recipe favorite. I have seen this kind of cookie ball go by so many different names: snowballs, Russian tea cakes, Mexican wedding cookies, you name it. They are beloved all over the world, and especially around Christmastime. But I’ve yet to see a funfetti version! For these, I stirred together a few different kinds of sprinkles to create my own unique blend. Starting with the traditional red, green, and white, add some ice blue sugar pearls and some hot pink jimmies for a fun, unique, and seasonal holiday twist. 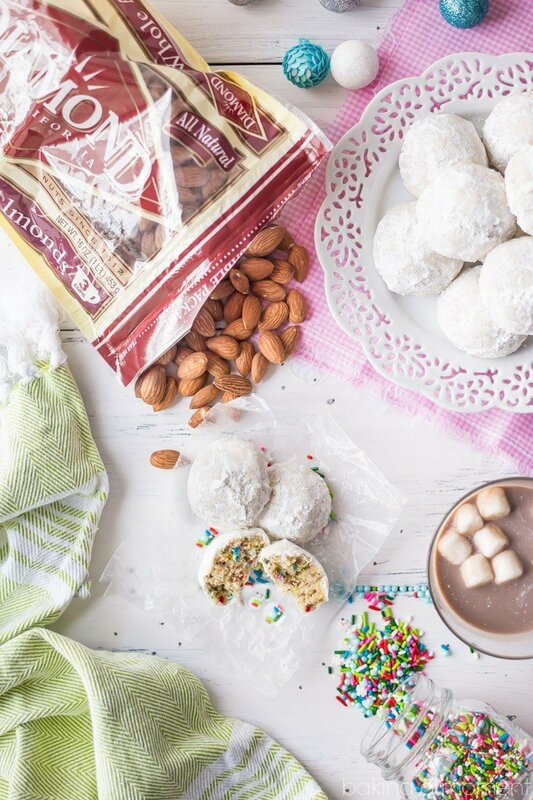 These cookies are so great with a cup of hot cocoa! What a great way to start the season, and how nice to have a few on hand, to nibble on as you bake up all your other delicious Christmas creations! Click here to learn more about Diamond Nuts, and be sure to follow along on Facebook, Pinterest, Instagram, Twitter, and YouTube! Lots more great ideas on my “Cookie Recipes Galore” Pinterest board! Preheat the oven to 350 degrees F, and line baking sheets with parchment paper. In a large mixing bowl, cream the butter and sugar together on medium-high speed until very pale and fluffy (about 3 to 5 minutes). Stir in the vanilla, almond extract, and salt. Add the flour, ground nuts, and sprinkles, and stir together on medium-low speed until combined. 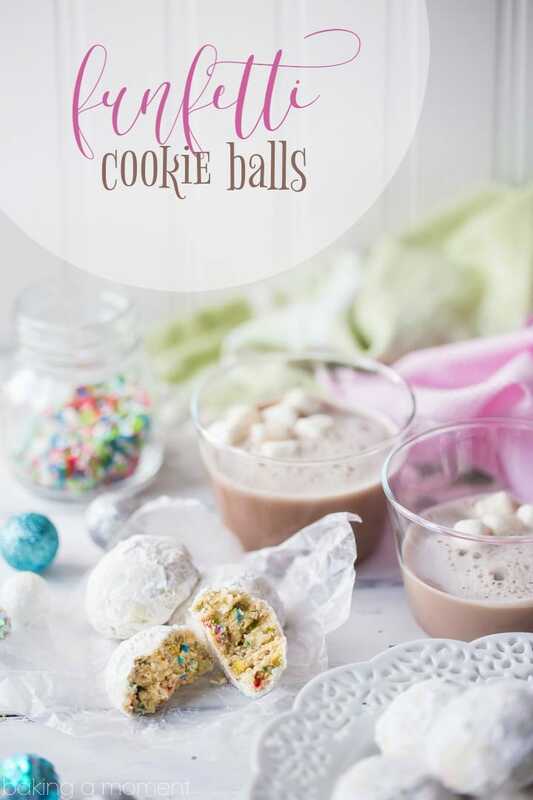 Use a 1.5 tablespoon cookie scoop to create balls. Roll the balls in powdered sugar, and set them on the prepared baking sheets. Bake for 12 to 14 minutes, or until just barely beginning to turn golden around the sides. Cool, then re-roll in powdered sugar to coat. Transfer to an airtight container to store. 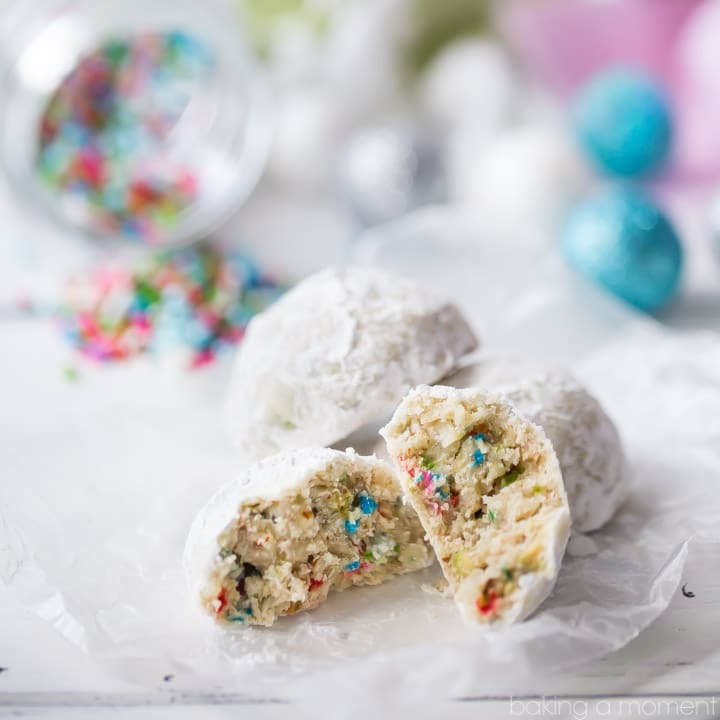 These funfetti cookies look like snowball cookies with a surprise center! Yes, totally! That’s just what I had in mind when I made them! Thanks Medha! Can I freeze the cookie dough? I haven’t tried that myself but I can’t imagine why it wouldn’t work?! Good luck and I hope you enjoy! Thanks for reading Fabiola! Great idea for the snowball cookies, Allie! What is the yield on this recipe…how many dozen does this make? Hey Kelli! I’m so sorry I forgot to include that. I got 38 cookies with my 1.5-tablespoon scoop. I’ll edit the post now to update it with that info. Thanks and have a great day! Yes!!! So cute!! They do go by a million names, right? I have a whole week of Snowballs coming up in December. I have never seen Funfetti ones though, and they are too cute! That is such a fun idea for a series, Sarah! I can’t wait to see what all you come up with. Thanks! I love the mixed confetti colors!! These will be perfect for edible gifts. More sprinkles are better for everyone!! What yummy cookies! These are so easy to make! They are a wonderful cookie to add to the holiday cookie platter!